The combination of potato, spinach and fresh ginger and garlic with the spices brings a wonderful aroma and makes you feel ravenous! Heat oil in a pan on medium heat. Add cumin seeds, allow it to splutter. Then add chopped garlic, ginger, green chilli and red chillies. 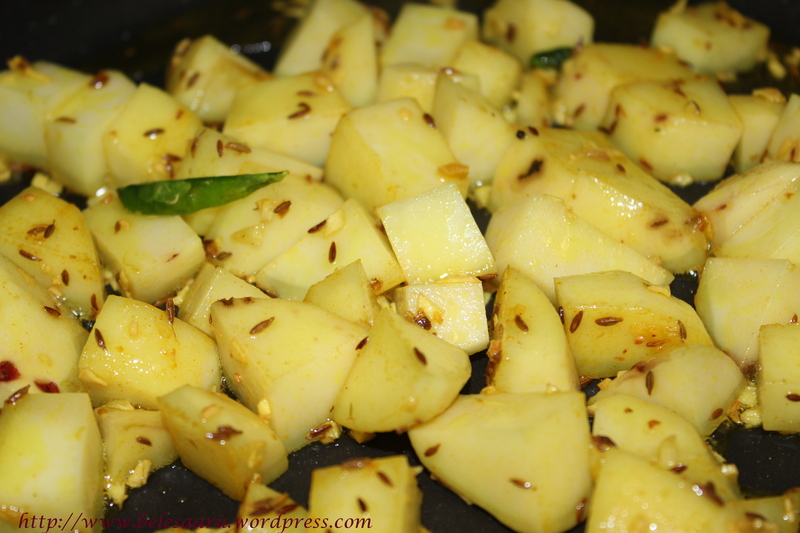 After about 6-8 seconds add cubed potatoes, turmeric and little salt, mix everything well. Close a lid and allow it to cook until the potatoes are tender (about 6-8 minutes). Now add the chopped spinach and coriander powder and stir it well. Add salt if necessary. Allow it to further cook for 3-4 minutes. Turn off the heat. Serve hot with rot is or parathas! One of my favourites too! My son is like yours, he loves green vegetables. I posted my version a few weeks back. This looks wonderful. I did take a look at the recipe Nazeen and its look great! This is loved by every one in our house too. Spinach and potatoes are fantastic together. Your version looks delicious! What a tasty sounding dish! 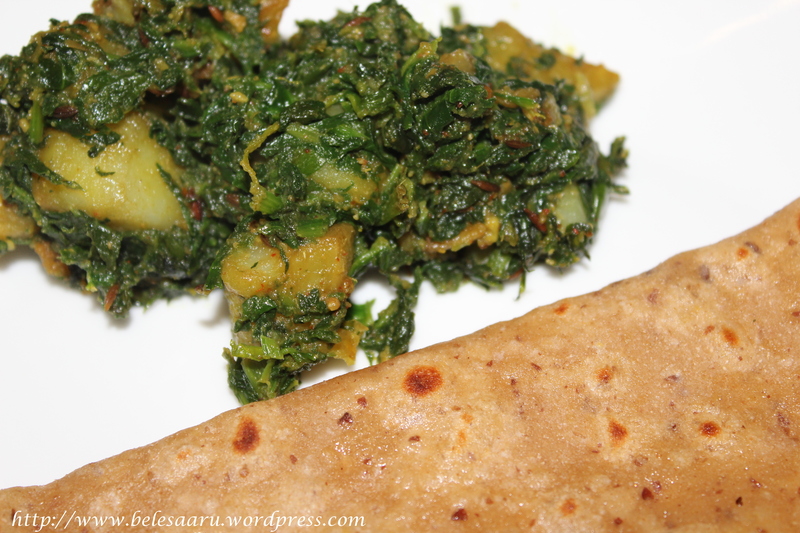 i too luv greens.. aloo palak looks yummy..
do visit my space wen u r free.. This looks like such a wonderful dish – I love the idea of adding warm spices to spinach (which I have never done) in addition to the cubed potatoes. I should really try your version of preparing spinach and experience a whole different way to enjoy spinach! 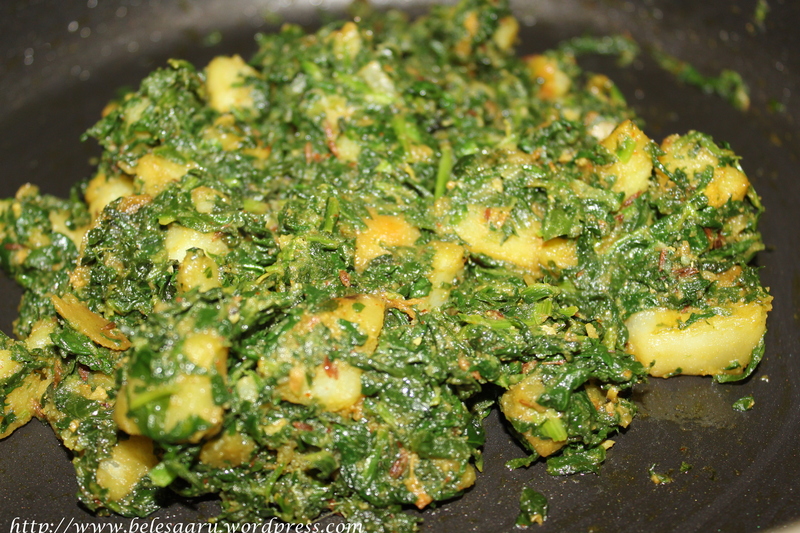 Deepti, I love the combination of spinach and potatoes…looks delicious! Thanks Juliana! You have a nice week ahead too.. I have never tried the combination of spinach and potatoes and I must say it looks very appetizing and tempting! 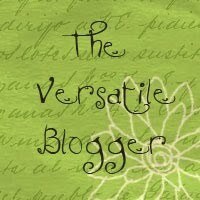 I would love this, too! So many yummy flavors!